Applied ASP.NET 4 In Context sets the standard for clear, simple, hands-on advice for learning and deploying Microsoft’s dynamic web solutions. Seasoned .NET author Adam Freeman explains how to get the most from ASP.NET by focusing on the features you need for your project. He starts with the nuts and bolts and shows you everything through to advanced features, going in-depth to give you the knowledge you need to use ASP.NET in a real-world context. ASP.NET 4 is the latest version of Microsoft’s revolutionary web technology. It is the principal technology for creating dynamic web pages on the Windows platform. Effective and powerful ASP.NET programming is easier than ever before with this informed and practical guide. Each topic is covered clearly and concisely, each chapter packed with the details you need to be truly effective with ASP.NET 4. The most important features are given no-nonsense in-depth treatment, and chapters include common problems and details on how to avoid them. 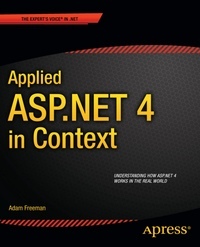 This book is for web developers who want to understand the context in which ASP.NET sits and the standards and best practices that can be employed to improve the efficiency and maintainability of their projects.